Defending world champions Germany won their final warm-up game before the FIFA World Cup against Saudi Arabia. Inspired first half performances from Borussia Dortmund's Marco Reus and RB Leipzig's Timo Werner help Joachim Löw's squad travel to Russia on the back of a win. With Manuel Neuer in goal once again and his Bayern Munich teammate Jerome Boateng returning from injury in defence, Löw’s starting line-up was as close to his first-choice selection – only without Mesut Özil – that he could have picked. The quality on show made an immediate impact as Germany took an early lead. Joshua Kimmich’s long ball met Reus’ run into the box perfectly and he volleyed the ball inside for Werner, who duly smashed home off the crossbar. Germany remained on top for most of the half, seeing two goals ruled out for offside and a Reus effort hit the post, but Saudi Arabia were far from out-played. Neuer and Mats Hummels both showed frustrations as Salem Al Dawsari twice had chances to score, but sent his shots wide of the mark on both occasions. The world champions, though, did get another goal before the break as Werner turned provider, playing a low cross into the box which, with the help of Thomas Müller, was bundled into his own net by Omar Hawsawi. Niklas Süle and Marc-Andre ter Stegen came on at half-time and both had busy second half performances as Saudi Arabia were the better side. Salem Al Dawsari caused problems for the German defence, but dragged his shot wide of ter Stegen’s goal on the hour mark. Müller had Germany’s best chance of the half as he streaked forward from midfield and shot at goal from the edge of the box, but Abdullah Al Muaiof was on hand to save. Before full-time, the visitors earned a chance to score from the penalty spot after Sami Khedira brought down Taisir Al Jassim in the box. Substitute Mohammad Al Sahlawi stepped up, saw his penalty saved by ter Stegen, but was saved by Al Jassim, who followed in the rebound the score. Saudi Arabia almost snatched a draw in the dying seconds but Al Sahlawi couldn’t finish a chance in front of goal after a counter-attack. Jerome Boateng played his first competitive game for club or country since the beginning of May. Marco Reus earned his first assist for Germany since March 2015. 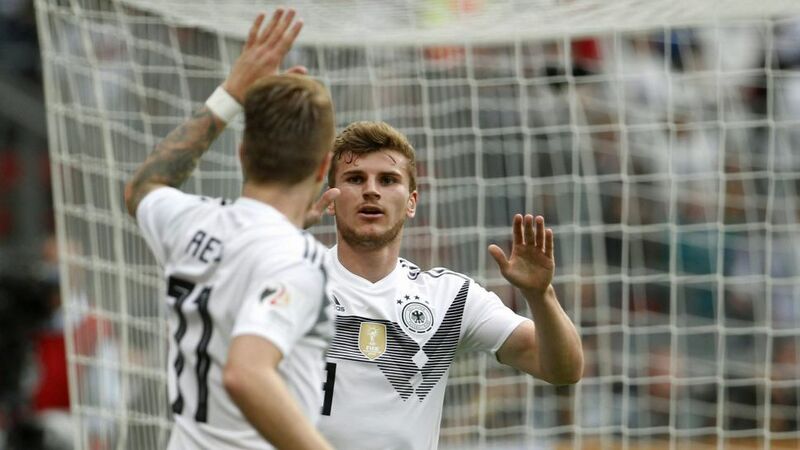 Timo Werner scored his eighth goal for Germany in his 14th international appearance.Germany have a 100 percent record from their four games against Saudi Arabia, winning each with an aggregate score of 19-1. Die Mannschaft will defend their world title in Russia this summer as the top-ranked team in the world, a position they regained in May.Al Sahlawi was Saudi Arabia’s top scorer in World Cup qualifying with 16 goals. Watch: Timo Werner and Marco Reus are in perfect World Cup form! Click here to find out all you need to know about Germany at the World Cup!